St Albans Choral Society raised over £2,000 for its two charities during the run-up to Christmas. Generous commuters donated £1,034 to the Society’s carol singers at the City station on 13 December in aid of the Hospice of St Francis, Berkhamsted, using contactless machines for the first time, as well as the more traditional buckets. 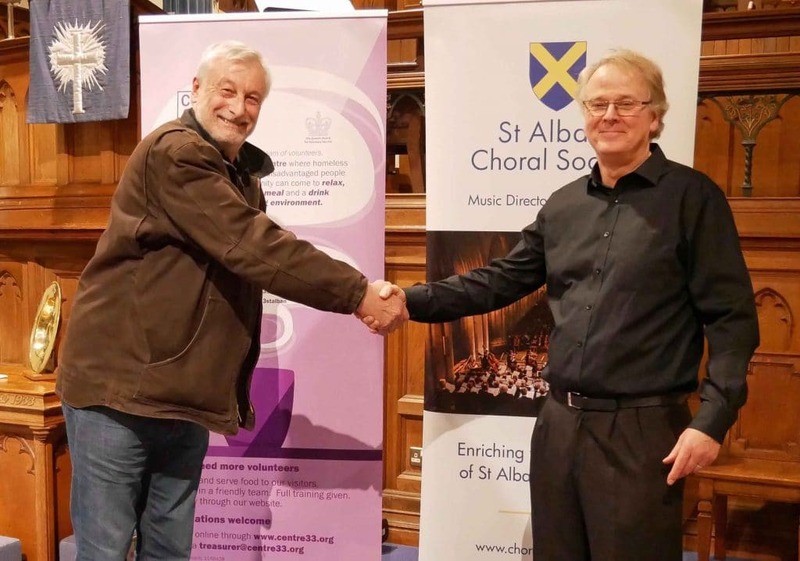 This collection followed the choir’s popular Christmas concert on 9 December in Marlborough Road Methodist Church, when donations to Centre 33, the charity for homeless and disadvantaged people in St Albans, totalled £938. Colin Simmons from Centre 33, pictured above with our Chair, Colin Dunkerley, thanked the Choral Society for its efforts. The choir’s volunteer Singing Group was also very busy during December, taking Christmas cheer into the community with three performances of carols and readings at retirement and care homes in the City: Allington Court Care Home, Cotsmoor and Fosse House. There was a further donation of £50 for Centre 33 from Allington Court.